Kamar Baldwin dropped 23 points in a 75-61 loss to Creighton on Friday night. Jimmy Lafakis/Collegian file photo. With a valiant effort in a Villanova loss behind them, it was up to Butler men’s basketball team to take a road win in Creighton to try and put themselves on the right side of the bubble. 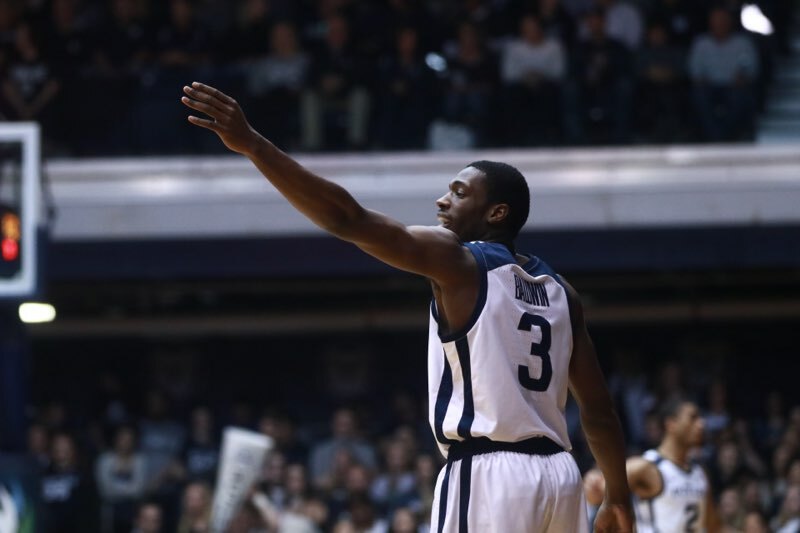 The starting lineup saw a shift, which saw a lot of Butler fans rejoice. You could say the first half started off with a BANG. However, the Bulldogs fell into foul trouble and forced Christian David and Bryce Golden into big minutes, where they stepped up and played well. We play 11 guys, we’re literally never in foul trouble, just let the guys play. But, the offense was not sustainable. Even though Kamar Baldwin had 23 points off 8-of-12 shooting, the rest of the team made just 15 shots. And the loss left Butler fans desperate for answers. As the Dawgs moved into the cellar of the league. Butler (3-5) falls into last place in Big East with Marquette coming up. And some reacted a little more egregiously. Really glad I didn’t waste my time watching another disappointing L. Vall’s seat getting hot yet? His squads are PATHETIC away from home. No excuse for missing tourney in a down yr for the league. Would be such a Butler thing to beat Marquette then lose to SHU, Georgetown, & SJU. Yet others still had hope that the ship will get turned around and Butler could go dancing for the fifth straight year. In order to go dancing, though, a win over 12th ranked Marquette would likely be necessary on Wednesday in Hinkle Fieldhouse. Tip is at 6:30 and those at home can watch on FS1.